Just received my author's copies of Rich Horton's The Year's Best Science Fiction and Fantasy, so here's a bit of pimpage for it. 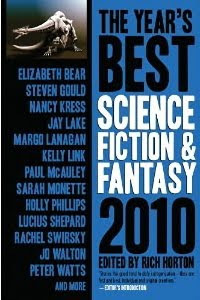 Thirty-one stories, including one by me, 'Crimes and Glory', pretty good for under a tenner. My visit to the dinosaur models in Crystal Palace Park wasn't my first encounter with Crystal Palace and the Great Exhibition. When I was born, my family lived in a cottage rented from Sir John Stanley Marling, 4th Baronet of Stanley Park and Sedbury Park. To mark the event, he gave my mother ten shillings, to invest on my behalf. Even in Stroud, which in the mid-1950s was still coming to terms with the twentieth century, acts of noblesse oblige like this weren't exactly usual. But Sir John came from a old family, with deep roots in the area. They made their fortune in wool, the main industry in that part of the Cotswolds for several centuries. His great-grandfather, Sir Samuel Marling, the first Baronet, was one of the people responsible for founding the grammar school, Marling School, I later attended. Before that, I was at Selsley Primary School, which was associated with the church Sir Samuel built for the village, next door to the family seat. Most of the church's stained class was by William Morris & Co; it was Morris's first real commission, with contributions from Philip Webb, Edward Burne-Jones, Dante Gabriel Rossetti, Ford Madox Brown and George Campfield. And in the field behind the church was a lone pillar; made of Cornish granite, it was bought by Sir Samuel Marling at the Great Exhibition in Crystal Palace, where he had a display of his woollen cloth. Those Victorians had a long reach . 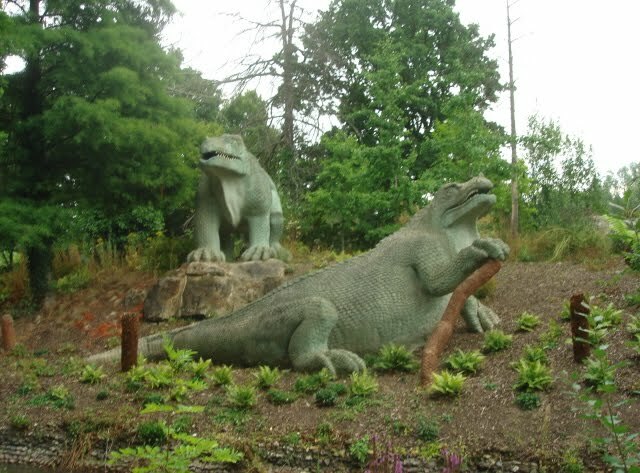 . .
Last Saturday I travelled along the new East London overground line from Dalston to Crystal Palace Park, in the unglamorous South London suburb of Penge, to see some famous dinosaurs. The park was constructed to provide a permanent site for Joseph Paxton's Crystal Palace, which for six months housed the Great Exhibition in Hyde Park. The board of directors wanted to include a feature 'containing a collection of full-sized models of the Animals and plants of certain geological periods', including the first life-sized representations of newly-discovered dinosaurs. They got their wish, and it is a monument not only to Victorian science, but also to a famous scientific feud. The board of directors first asked Dr Hilary Mantell, who had discovered and named the second known species of dinosaur, Iguanodon, and had amassed a huge collection of fossils, to supervise construction of the models. But Mantell, after suffering years of pain from a serious injury to his back, was dying. He declined the honour, and it passed to his great rival, Professor Richard Owen. Owen was a formidably talented and ambitious anatomist, and by all accounts an implacably ruthless and dislikeable man. 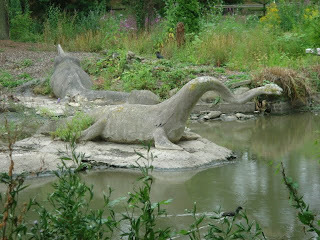 Although Mantell had championed the idea of a group of ancient, large, reptile-like animals, it was Owen who had recognised their defining characteristic - fused sacral vertebrae which allowed the huge animals to move about on land - and named them: dinosaur, from deinos 'terrible' and sauros 'lizard'. But this wasn't enough for Owen, who despite his formidable talent appears to have suffered from a gigantic inferiority complex. He'd spent years attempting to destroy Mantell's reputation, rubbishing his scientific papers, and trying unsuccessfully to prevent the Royal Society from awarding him the prestigious Royal Medal (there's a wonderful description of their feud in Deborah Cadbury's The Dinosaur Hunters: Owen as a mustachio-twirling monster of ego, Mantell as a romantic hero beset by impossible odds). But now Owen had triumphed: his enemy's fatal weakness had given him a wonderful opportunity to present his ideas for public consumption. Mantell died before the park was completed, and his twisted lower spine ended up as a gruesome trophy in the Hunterian Museum in the Royal College of Surgeons, where Owen had the position of Hunterian Professor. You couldn't make it up. And so, with the help of the director of the fossil department at Crystal Palace, Benjamin Waterhouse Hawkins, Owen set to immortalising his ideas about dinosaur anatomy in cast iron and concrete. Unfortunately, many of those ideas were completely wrong. To be fair to Owen, he was making guesses from a small and incomplete selection of fossils. But he also believed that any progression in animal evolution was due to divine laws set in place by God the Creator, argued that all animals were variations on an ideal type, and refused to countenance any evidence that he might be wrong. 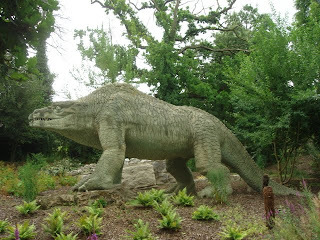 So while Mantell had come to believe from his examination of later fossil finds that Iguanodon had shortened forelimbs and could stand upright to browse on tree branches, in agreement with modern interpretations, Owen depicted Iguanodon and several other dinosaur species as clumsy, dog-like quadrapeds (both he and Mantell mistook Iguanodon's hooked thumb for a horn). Before the turn of the century, a more enlightened scientific community regarded the models as a horrible embarrassment. Today, they look positively antediluvian: quaint relics of a more primitive era of science; props from some sci-fi adventure quota quickie. Still, other models, such as those of plesiosaurs and several species of early mammals, were more accurate, and in its day the park was a roaring success, and helped drive the mania for dinosaurs that persists to this day. Owen went on to found the Natural History Museum, and to suffer from a severe reversal in his reputation when he clashed with Thomas Huxley and other supporters of evolution by natural selection. The Crystal Palace burned down in 1936; Owens' and Hawkin's models, recently restored, are still imposing and fascinating. If you get the chance, they're well worth a visit.